Uses the entire tissue roll, which helps eliminate stub roll waste. No cardboard cores. No wrappers. No boxes. That equals 95% less packaging per case than GP standard bath tissue. Less waste, less cost, more green. 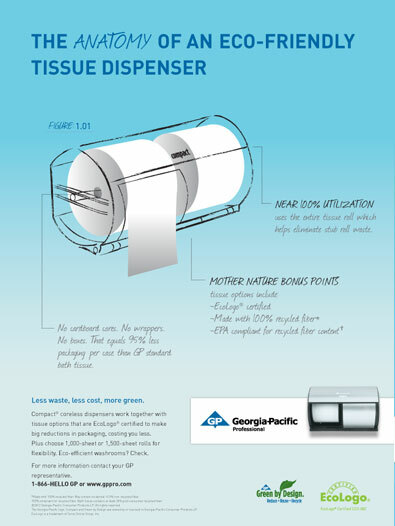 Compact coreless dispensers work together with tissue options that are EcoLogo certified to make big reductions in packaging, costing you less. Plus choose 1,000-sheet or 1,500-sheet rolls for flexibility. Eco-efficient washrooms? Check.